April 11, 2017, 10:14 AM · We have heard that violin-making has reached a new "Golden Period," but what do modern violins actually sound like? Below are several videos from an event last Friday in which Los Angeles Philharmonic Concertmaster Martin Chalifour tried out 50 modern American violins, each by a separate maker. 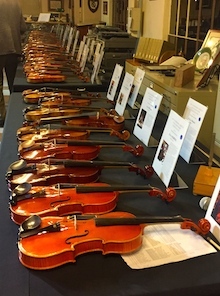 It was all part of a Contemporary American Violin and Bow Maker Exhibition and Sale at Metzler Violin Shop in Glendale, Calif., which included violins, violas, cellos and bows by 95 modern luthiers. On the following day, violas and cellos were tested by violist Richard O’Neill and cellist Marek Szpakiewicz (more to come on that!). About 100 people came to each event, and instruments were available for testing all weekend. Several dozen of the luthiers had traveled to California for the event and were present as well. On April 23, Metzler Violins will take the show to Las Vegas, holding the same exhibit at the Nevada School of the Arts in Las Vegas. Prices of the violins ranged from $7,500 to $48,000. That upper price was an outlier, though; most were below $20,000, and many below $15,000. Obviously, the best way to test a violin is to play it yourself or hear it live, but I hope that the following videos help familiarize you with some of the top names in violin-making today and also give a small sample of the sound and playability. The videos include the 49 violins in the exhibit, plus Chalifour's own modern violin. Before each video, I have listed all the luthiers, with links to their websites (when available). I've also included some of my own observations and facts. Testing 50 violins in one night is one exhausting feat, and I applaud Chalifour for his enthusiasm and his obvious respect for the art of violin-making throughout the evening. He started around 7:30 p.m. and ended two hours later, with barely a break for water! When you test a violin, you want to check the balance of sound on all strings (does the voice match? ), the response (do fast notes "pop"), power and projection, quality of tone, and playability (a factor that can be pretty individual, based on a person's size). Chalifour played the beginning of the Tchaikovsky Concerto as well as the end of Bach's Chaconne -- about two minutes of music -- to demonstrate those qualities. Of course, playing the same excerpts on 50 different violins in this speed-dating set-up has its considerable challenges. Every violin has a slightly different size and different set-up. Many things can vary just in the physical construction, among them: the width of the neck, the length of the fingerboard, the thickness of the ribs, the overall weight of the fiddle, the placement of the chin rest, and the type of strings used. Those physical differences can result in changes in variables such as finger placement for accurate pitch, bow angles for string crossings, bow pressure for good tone, etc. In other words, it's a whole new calculus for every violin. The first two violins in this segment were made by brothers from Toronto, Artak and Hratch Armenious. Michael Becker of Chicago is among the more well-known of modern makers. During the first part of this demonstration, Chalifour seemed to find Peter Bingen's violin to be very easy and enjoyable to play. You might remember Andrew Carruthers from his cool violin-related T-shirts and graphic art as well as his fiddle-making! Joseph Curtin is one of the most famous modern violinists and has led many of the scientific studies on qualities of instruments. His was the highest-priced instrument, at $48,000, a reflection of his established reputation. I played the violin by Anton Domozhyrov (who was present at the event) and was impressed with its sweet tone and playability. Jedidjah de Vries works at Metzler's shop; he is pictured at right with his violin. I was especially impressed by Alina Kostina's violin (pictured), with its especially dark tone, as were a number of young violinists who stayed late into the night to test it themselves, after the demonstration. Kostina's mentor is David Gusset, who also had an excellent violin in this segment, which Chalifour very obviously liked. Both completed their violins in Eugene, Oregon, and both were present for the event. Lisa Gass is known in LA for having a bass shop; she completed her violin in 1986. Chalifour demonstrated his own modern, by Mario Miralles, in this segment. It's a violin made from different and hard-to-carve wood - bird's eye maple. Francis Morris's violin seemed easy to play. Brian Lisus, who was present, also had an excellent cello in the follow day's exhibit. I won't forget meeting Guy Rabut years ago in Indianapolis and seeing his "Picasso"-like fiddle (there's a picture in this link). Rabut's violin at this event was more "normal"-looking; when it came to the sound, I noticed its power. Also, the violin by Ernesto Ramirez (Mexico City) also stood out for its precision-pitch and color; it had a pure tone, in my notes I said there was "less junk-noise." The violin by the Rezvani brothers was a bit smaller, something to note for those seeking a good-sounding smaller fiddle (hard to find!). Antonio Rizzo's violin seemed to inspire bouncy and light playing. For Wladek Stopka's violin, I noted that I felt it had an "old-world sound." Both Ute Zahn and Tim Summerville were present at the event. I'd met Zahn last summer, when she one of her violas was being tested in a similar demonstration at the American Viola Society Festival at Oberlin. Her fiddle had nice dynamic range, and a student testing her instrument the next day liked the size, beauty and feel of it - and a good price-point. 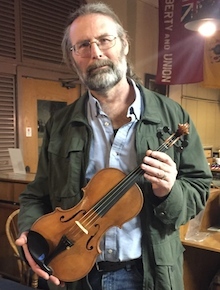 I was especially interested in the finish on the violin by Tim Summerville (pictured) -- he called it a "corduroy" finish, as you could really see the groove in the wood - just beautiful. It reminded me that these instruments are as much works of visual art as they are the tool of our trade as musicians. April 11, 2017 at 08:31 PM · stupendously interesting, many thanks Laurie! April 11, 2017 at 09:56 PM · Good one! Yay! Bravo! April 12, 2017 at 01:35 AM · Wonderful article - thank you Laurie for sharing the skill, art, and workmanship that goes into crafting these beautiful instruments. April 12, 2017 at 02:50 AM · I was hoping to see Terry Borman, an Arkansas luthier, among the list. Anne Akiko Meyers has one of his among her group. April 12, 2017 at 03:06 AM · Here is more on Terry Borman; he makes excellent fiddles! April 12, 2017 at 05:59 AM · Something interesting: Luthier Brian Lisus is a South African expat, and as far as I know (but I could be wrong), his style would be derived from the English school(s) of violin making. So always nice to have variety present. April 12, 2017 at 11:13 AM · Very very interesting! Thanks for sharing! Altough I still miss some makers on the list. Schleske and Rittwagen, Greiner and Hargrave to call the German ones. April 12, 2017 at 12:03 PM · The "brothers from Toronto, Artak and Hratch Armenious" are actually son and father according to a testimonial on their web site. April 12, 2017 at 04:58 PM · I'll fix that, Jay. Also, yes, I welcome everyone's suggestions of other modern luthiers that did not happen to be in this demonstration, and I welcome to share your experiences with the ones who are. This was just one demonstration - a nice, big one - but of course it could not include everyone! The more that the serious violinists of today can connect with the serious luthiers of today, the better. "Very very interesting! Thanks for sharing! Altough I still miss some makers on the list. Schleske and Rittwagen, Greiner and Hargrave to call the German ones." Many of these events are supported by taking a percentage of the sales price on the instruments which sell. Makers who have a substantial waiting list, don't have anything available to sell, or have negotiated limited distributor rights may not want to participate or undergo the expense, particularly if it involves getting instruments back and forth from other countries. Julie Reed, in New York, also does something like this annually. There are other opportunities too, from the Violin Society of America competitions (where one might be able to try 450 instruments), to the traveling Cremona makers exhibit, to the American Federation of Violin and Bow Makers "Makers Meet Players" events. April 13, 2017 at 09:23 PM · Wow, Kenneth! I am impressed! I do find it interesting that those qualities can come across, even on Youtube -- it's obviously not exactly an audiophile-quality listening experience, but hopefully it does give people a starting point! April 14, 2017 at 04:52 AM · Wonderful article!! I got a bit fatigued after a while listening to videos, like tasting wine. The violinist is great and makes everything sound wonderful, plus they are of course made by the best luthiers. I wouldn't say I could identify the Joseph Curtin (though I am an owner of one), but I did certainly think the sound of it was Curtin-like, and thought so proudly. One unique case, which sounds unique even in a video, was the Cox violins. Very dark! Milky, chocolaty, and rich. April 17, 2017 at 11:24 PM · Anyone who is interested in a contemporary violin maker should consider the work Of Jamie Marie Lazzara, in Florence Italy. She made a violin for Itzhak Perlman, a copy of his "Soil" Stradivarius of 1714. Since acquiring one of her violins, I no longer play my Lupot. Her work is quite reasonably priced, at 12,000euros. That is a fraction of what many of the makers listed above charge, whose instruments I have played.